There is a famous tale about Columbkille that stands as one of the first copyright cases on record: Columbkille was so anxious to have a copy of Finnian’s Psalter that he shut himself up at night in the church that contained it and secretly transcribed it by hand. He was discovered by a monk who watched him through the keyhole and reported it to his superior. Bibles and prayer books were so scarce in those days that Abbot Finnian claimed the copy, refusing to allow it to leave the monastery. Columbkille refused to surrender it until he was obliged to do so, under protest, on Finnian's appeal to King Diarmaid, who said, "To every cow its calf," meaning to every book its copy. While historically a bit unclear, an unfortunate period followed, during which, owing to Columbkille's protection of a refugee and his impassioned denunciation of an injustice by King Diarmaid, war broke out between the clans of Ireland, and Columbkille became an exile of his own accord. Filled with remorse on account of those who had been slain in battle and condemned by many of his own friends, he experienced a change of heart and an irresistible call to preach to those who had not heard the gospel. 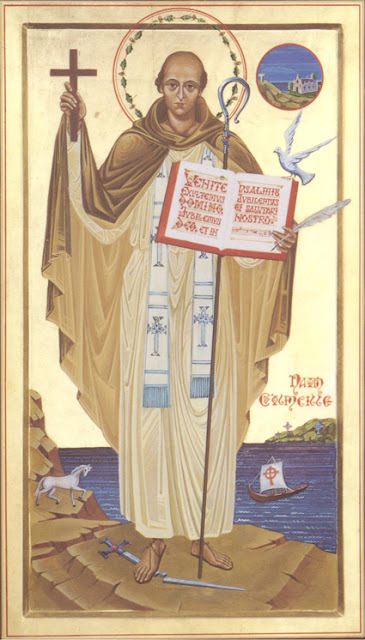 In 563, at the age of 42, he left Ireland with 12 companions and landed on an island now known as Iona. Here on this desolate rock, only three miles long and two miles wide, in the northern sea off the southwest corner of Mull, Scotland, he began his work; and, Iona became a center of Christian learning. It became the heart of Celtic Christianity and a potent factor in the conversion of the Picts, Scots, and Northern English. Monks from the monasteries established by Columbkille would later travel to mainland Europe and Christianize the Frank and Germanic tribes. O King of night and day?"